In Acts 1:6-11, Luke tells the story of the Ascension of Jesus, which he’d already told in Luke 24:50-53. Why did Luke include the story of the Jesus’ Ascension in Luke and Acts when the writers of the other gospels did not include it? I want to explore three possible answers and tell which I find the most convincing. 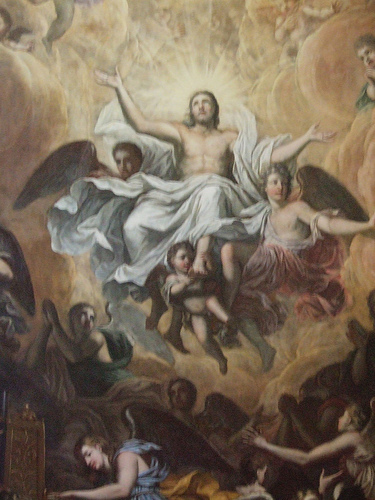 Most of the times I have read Acts or taught Acts, I thought the story of the Ascension was included to satisfy our curiosity about how he returned to heaven. The other gospels do not tell the story. If the main reason this story is included is to satisfy our curiosity, then why would the other gospels not include it? A lot of stories are left out of the gospels. For example, there is a lot of information about Jesus’ childhood that we would like to know. But it is not included. If Luke’s motivation was to satisfy our curiosity, he would have included a lot more stories. According to Mark Dever, the reason Luke includes the Ascension is to show that Jesus was exalted to heaven as Lord. Readers would then know that Jesus is enthroned in heaven. But Luke makes no mention of Jesus being enthroned in the story. He ends the story with Jesus vanishing out of the disciples’ view and the disciples gawking at the place of ascension. As I’ll make clear in surveying the third option, I think the interaction between the angels and Jesus’s disciples is about what they need to do now. Perhaps the exaltation is being intimated through the Ascension, but there is probably more to it than just the exaltation. The event of the Ascension has to make sense of what the angels tell the men. In Ben Witherington’s commentary on Acts, The Acts of the Apostles: A Socio-Rhetorical Commentary, he connects the story with 2 Kings 2, the account of how Elijah is taken into heaven and Elisha succeeds him in his role. Before God takes Elijah into heaven with a whirlwind, Elijah tries to convince Elisha that he needs to stay while Elijah himself needs to leave. Elisha struggles with this. But Elijah gives him a double portion of his spirit. On the way to the place where Elijah is taken up, he performs the miracle of parting the waters of the Jordan. He does this by striking it with his cloak. After Elijah is taken up, Elisha takes his cloak, goes to the banks of the Jordan, and parts the water. This shows that Elijah’s power and authority as the prophet of God has been passed on to Elisha. This is the purpose of Elijah’s Ascension. There are parallels between this story and the Ascension of Jesus. The Apostles are apprehensive about Jesus’s departing. They will receive the Spirit. They will perform miracles like Jesus had while he was on earth. If Witherington is right, and I believe that he is, the story of Jesus’ Ascension shows that Jesus’ power and authority has passed to the church. That’s why Luke tells it at the beginning of Acts. Everything that Luke had written about Jesus and His mission was now transferred to the ragged band of disciples gawking at the heavens. These people would carry on the mission of Jesus in his authority. So the church’s job in the absence of Jesus is to continue (through His power) his mission of spreading the Kingdom of God. This is what the Ascension in Acts teaches us. Thanks for your reflections! Very well done! How do we live out this calling to mission and replicate his ministry searchers of kingdom testimony, expectant power, social justice, and gracious hospitality? Pingback: Where Is Jesus Now? And Where Did He Go After His Resurrection and Ascension? | When is Jesus Coming Back? Pingback: Luke’s Insights Into the Second Coming of Jesus | When is Jesus Coming Back? So I have a question: If you saw your beloved, back-from-the-dead “leader” levitate off of the ground until he is swallowed up into a cloud, to never be seen again, by you or anyone else on planet earth, would that be something you might include in your one and only “gospel” about him??? Yet Mark, the first gospel written (the original, not the altered versions), Matthew, and John say NOTHING about an Ascension! The ONLY person who mentions an Ascension (in his two books, Luke and Acts) is someone who tells us in the first chapter of Luke that he is NOT an eyewitness to any of these events; that he obtained this information, at best, second hand! So we are asked to believe that Matthew and John, two alleged eyewitnesses to both the Resurrection and the Ascension, say not ONE word about this fantastic, supernatural event, but someone who admits that he was *not* an eyewitness is telling us the factual details of a real, historical, law-of-gravity-defying event??? Gary, A careful reading of the Gospels will reveal several passages where Jesus spoke about His leaving, departing or going away. These passages were of course fulfilled in the ascension. Please read the Gospels and not be so skeptical that you ignore the obvious. My friend. Accept the obvious. The Ascension Story was a Lukan invention.